Just so we're all on the same page, the art world doesn't like figurative painting and they especially hate portraiture, right? I thought everyone knew this to be the case. I though I knew this to be the case. But after typing it out so bluntly, I'm quickly realizing just how ridiculous it sounds. First of all, what do I mean by 'the art world' anyway? What a meaningless generalization. There are tons of different 'art worlds.' Secondly, plenty of people love figurative painting and some of the most successful, well-known contemporary artists are figurative painters. But then why do I still have the nagging suspicion that my initial instincts are warranted - that there is a real bias against a certain type of figurative painting by a certain segment of the art world? You must know what I'm talking about. Perhaps you can't articulate it any better than I can, but somehow you find yourself cognizant of this allusive prejudice. You're aware that there is a perceived difference between 'cool' figurative painters like, say, Lisa Yuskavage, Marilyn Minter, or Nicole Eisenman, and 'uncool' figurative painters like, say, the guy with the mustache who wears a fedora and carries a huge chip on his shoulder because the art snobs refuse to pay attention to his work even though he is a master draftsman and mixes all of his own freakin' paints from scratch! I'm doing a terrible job of explaining this, aren't I? Well, if you're still confused, just flip through any book that surveys hip contemporary painters (Vitamin P2, Painting Today, Painting People, to name a few) or visit any installment of the Whitney Biennial and you'll quickly begin to get the gist. Certain figurative painters are acceptable, others, not so much. Suffice it to say that I sense a bias against realistic paintings of the human figure to exist (warranted or unwarranted) in the contemporary Art World (whatever Art World means when you capitalize it like that). I bring this up because I am trying to describe the environment in which a show like Selfish, currently on view at Katherine Cone Gallery in Culver City, exists. It is a figurative painting show in the most traditional sense. Curated by artist Sean Cheetham, Selfish brings together 20 artists who each submitted a self-portrait. It's no surprise that such a conservative (is that the right word?) 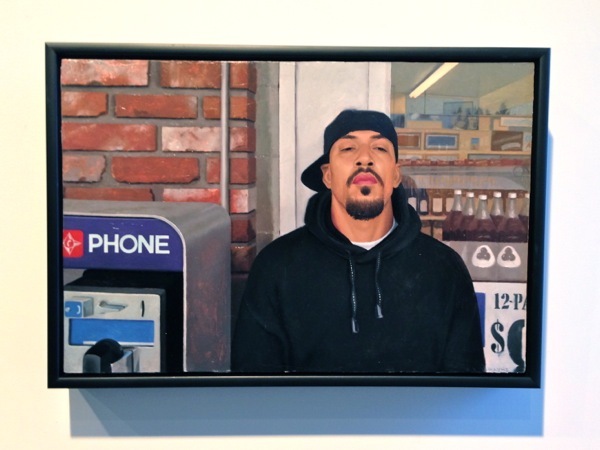 exhibition stands out among the trendy Culver City art scene. 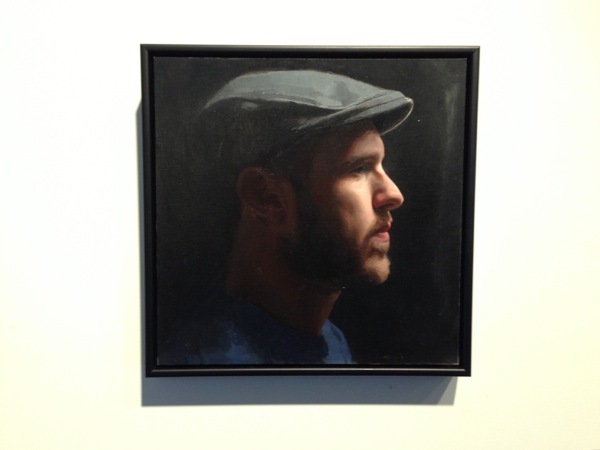 What you will find in Selfish is a good, old-fashioned painting show with some skillfully executed works on display. 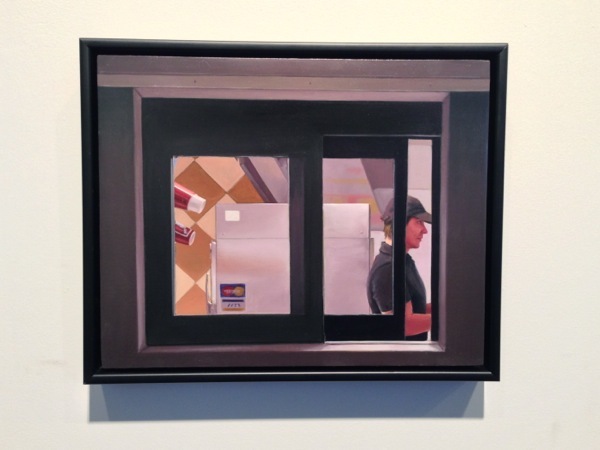 There is a small painting by the always excellent Marc Trujillo, featuring his likeness through the window of a fast food joint. There is also an eye-catching profile pic contributed by artist Stephen Schirle. And Cheetham himself has a piece in the show (of himself) in which he proves to know his way around a palette and panel. That said, two works (that just so happened to be installed next to each other) stand out as the real showstoppers. Pearhead, by Natalia Fabia, is a knock-out. It's typical for a traditional oil portrait to follow the tried-and-true formula of 'figure emerging from a dark background.' The contrast is exploited in an attempt to articulate light. But Fabia's painting seems to be completely made of light. Composed in a high-key palette of golds and pinks, it truly glows. Wayne Johnson, on the other hand, displays a mastery of dark colors in his standout piece Past, Present, Future (image at top). The subtle details in the figure's black sweatshirt and hat are painted beautifully, which is harder than it looks to pull off. I heard a couple of viewers at the opening note that the painting looks like a photograph. FYI, that isn't always received as the compliment you intend it to be, but in this case I think it is an accurate description and it points to a stylistic choice by Johnson that serves the work well. 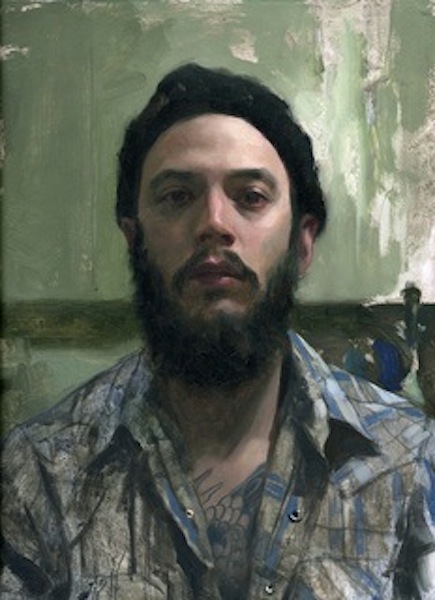 The painting is articulated with a bold precision that echoes the stoic expression on the subject's face. There are no cheap tricks here. Johnson seems to put each brushstroke precisely where he intends for it to go and the result is superb. 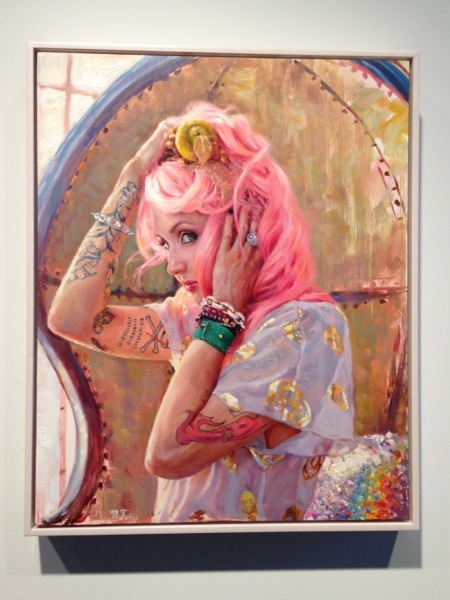 Selfish, curated by Sean Cheetham, is on view at the Katherine Cone Gallery through June 22, 2013.